A few superlatives to get you going. Not only is the impressive art deco Boisdale building which overlooks Cabot Square Canary Wharf’s largest restaurant, it also boasts London’s widest selection of whisky, the city’s biggest cigar club and is one of the leading jazz, soul and blues venues in the UK. Add to this a fully stocked crustacean bar, a spot of haggis and a trademark tartan carpet, and what you have is a deliriously different kind of restaurant that you’re unlikely to find elsewhere. Even the smaller, more subdued Boisdale restaurants in Belgravia and Bishopsgate can’t compare. With all this said, there’s a real danger of the food at Boisdale taking a back seat. The likes of potted rabbit, Aberdeen Angus steaks and fish & chips are somewhat ubiquitous options which have a price point a couple of quid higher than they deserve, with the latter coming in at £15.50. Though perhaps this is not any higher than is standard for the location. That in mind, a main of fish pie is as creamy, rich and comforting as it should be, stuffed full of smoked haddock, mussels and cod with a crunchy cheesy crust that’s worth every penny of the £14 asked for it, and when you get onto classics like roasted haggis with neeps and tatties, or some home-cured Scottish salmon gravlax, it’s clear that Boisdale are in their element. Their stunning oyster range is also worth a look, being the result of a collaboration with bivalve bigshot Wright Brothers, which saw industry experts pick the best of the bunch for their very 2012-ly titled Oyster Olympics selection. Boisdale is unmissable at Cabot Place, E14 4QT. 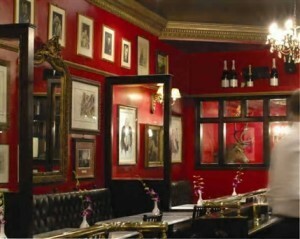 www.boisdale.co.uk.